There are many different types of disposable contacts lenses: daily use, monthly, etc. Each type has different limits for how long they can work effectively, but in general most contact lenses can still be worn to drive at night even after several hours of wear. If you have any questions about your specific contact lenses, contact your eye doctor or the manufacturer of your contact lenses. Daily disposable contact lenses are only worn once. Each morning a fresh pair is inserted and each evening they are thrown out. With daily use lenses there is no cleaning or sanitation required. Rather than cleaning the lenses for the next day, they are thrown out and replaced with a fresh pair. Many people like this type of contact lens for the convenience. Daily disposable contact lenses are the most hygienic choice. They don’t have to worry about contact solution, cases or cleaning. Daily use contacts are also a great choice for those that suffer from allergies since any allergens that have accumulated on the lens will be thrown out each day. Each type of contact lens functions a little differently. Sure, they are all small sheets of plastic that are placed over the eye to improve vision, but each manufacturer uses a slightly different process to achieve this result. Some disposable contact lenses specifically tout their ability to work well in low light while others focus on breathability or convenience. Your eye doctor will be able to help you find the best disposable contact lenses for your specific needs. How Long Can Daily Contacts Be Worn? Many people wonder how long disposable contact lenses can be safely worn. The answer entirely depends on the type of lenses you use. Daily disposable lenses are designed to be worn once and then thrown away. Since you are not supposed to sleep in these contact lenses this means that many people will wear them for about 12 hours. Of course this will vary depending on your schedule and your eye doctor’s recommendations. On the other hand some people choose to wear contacts that last for about two weeks. These lenses are removed each night, cleaned and sanitized and then reinserted in to the eye each morning for a total of two weeks. Some contact lenses are designed for a month of use. It all depends on the type of contacts that your eye doctor recommends for your situation. Taking care of your contacts and wearing them for the designed amount of allowed time will help protect your eye from eye infections and other types of contact lens related problems. If you have contact lenses that must be thrown out each day, they should be worn only once and then disposed of. Wearing contacts longer than recommended can lead to infection and some eye infections can lead to blindness. Although proper cleaning is important, many people fail to keep their contact lenses clean. A recent study suggests that only 2% of contact lens wearers follow the recommended protocol for cleaning their lenses. If you are unsure of how to properly clean yours, contact your eye care professional. 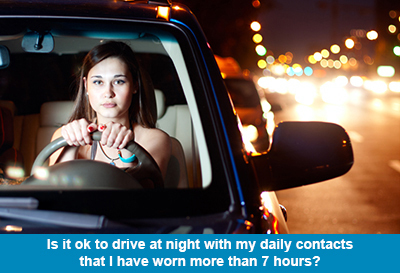 Many people worry that they will not be able to see properly when driving at night while wearing contact lenses. Many contact lenses are specifically designed to work well during low light situations. Other contact lenses can be worn even overnight, making them an ideal choice for those that don’t want to replace their contacts each day. Talk with your doctor about the options available to you. Many people find that contact lenses are easier for driving at night since they don’t have the glare that glasses give off. Contact lenses also allows you to have full peripheral vision making it easier to drive, whereas glasses may block a portion of your peripheral vision. If your contact lenses are being worn according to the instructions given by your eye doctor and are properly cleaned and cared for, you should be able to safely wear them when driving at night, unless your eye doctor tells you otherwise.